For the last 700 years the source of the finest rubies was found in a 70 square mile area east of Mandalay. This location of unparalleled significance to the gemstone world is known as the Mogok region of Myanmar (Burma). having a soft, sensuous, diffused appearance. Secondary colors of purple and orange in larger stones detract from value. Pinkish overtones that are not overpowering can significantly increase value. The term "Mogok" is used to describe excellence in ruby. Since 1992, most commercial quality ruby rough has been minded in another region of Myanmar, Mong Hsu. These gemstones are typically heated to change their color to a more appealing shade of red. 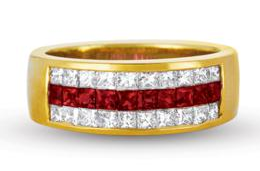 Rubies have been heated to improve color for over 1,000 years. It is believed Pliny described this process when he wrote about improving a rubies color. David Federman in the Modern Jeweler's Consumers Guide to Ruby stated, "Flowery Thoughts on Precious Stones written about 1240 AD by Teifaschi, an Egyptian gem dealer, gives an eyewitness account of the process as it is still practiced today." 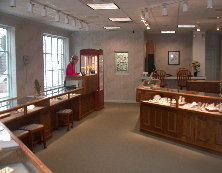 Richard B. Drucker, in an article entitled "Truth or Consequences in Jewelers Circular Keystone , May 1999, describes the process in some detail. He claims in the early 1980's rubies were heated to 1,600 to 1,800 degrees Celsius to improve color and reduce visible silk inclusions. At some point the process was modified in an attempt to heal factures on the surface of the gemstone. He states, "They later modified this enhancement to fill cavities as well. The modified process involved packing the gems in borax and they heating the crystals. The borax acted as an insulator and would melt, forming a glass that filled any surface cavities." "The latest treatment goes beyond this, almost to the melting point of corundum - 2,050 degrees Celsius. This requires insulation in borax, silica or aluminum. As the crystals heats up, the fractures transform into a molten state and "heal" themselves. The extreme heat and the borax/silica/aluminum flax promote the healing of fractures. As the ruby cools, the treatment can leave a glass-like residue on the surface, in fractures, or even sometimes encased in healed fractures within the gem." Drucker adds, "But the superheat has been so successful that Thai treaters now us it almost exclusively. An estimated 95% of all rubies sold in Thailand are from the Mong Hsu deposit. One Thai lab estimates that filling is present in 90% of the Mong Hsu material, whether in cavities, fractures, or healed fractures." If you are in the market for a ruby it would be prudent to assume it has heat treated or heat treated and filled in the manner described above.